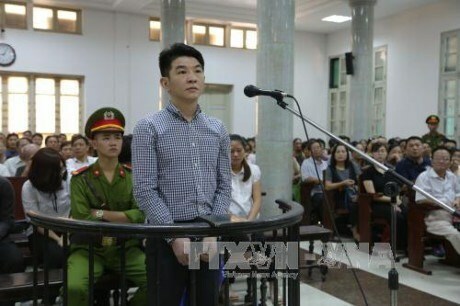 Hanoi (VNA) - The Hanoi People’s Court on August 21 opened legal proceedings against a criminal case regarding an illegal virtual gold trading floor. The case involves top managers of the Hanoi-based Khai Thai Consultant Limited Company (KTIC). KTIC General Director Hsu Ming Jung (also called Saga) from Taiwan and his six Vietnamese accomplices have been tried on charges of swindling 264 billion VND (11.7 million USD) from more than 700 investors. Hsu Ming Jung, 42; Doan Thi Luyen, 30, managing director of the company; Nguyen Manh Linh, 30, director of the company; and Trinh Hoang Binh, 42, the company’s chief accountant, have been charged with fraud pursuant to Article 139 of the Penal Code. Two other Vietnamese people, the managing directors of the company’s branches at the Plaschem Building in Hanoi, Dinh Thi Hong Vinh, and at the Lotte Building in Hanoi, Tang Hai Nam, have been also charged with the same offence. They were arrested in October 2014 after they were found setting up an illegal gold trading floor to cheat investors. According to the indictment, Saga established the KTIC in November 2011, with a charter capital of 20 billion VND. The company opened three branches with 18 business offices. Investigations showed that between December 2012 and September 2014, the Taiwanese CEO and his accomplices illegally set up a gold trading floor to raise over 280 billion VND (12.4 million USD) at high interest rates from 717 investors. They then appropriated most of the funds, police said. The company had paid a total of 17.5 billion VND (777,000 USD) in interest to the investors and appropriated over 264 billion VND. Hsu Ming Jung and his accomplices used sophisticated methods to fraudulently take their funds via a fake investment trust, police said. The company also offered lofty salaries and attractive bonuses to its employees attracting investment.